Ranch pretzel bites are addictive little nibbles of salty pretzels coated in a tangy ranch mix and baked to perfection. It’s a great recipe to make a lot of for gifting or having on hand for holiday gatherings! 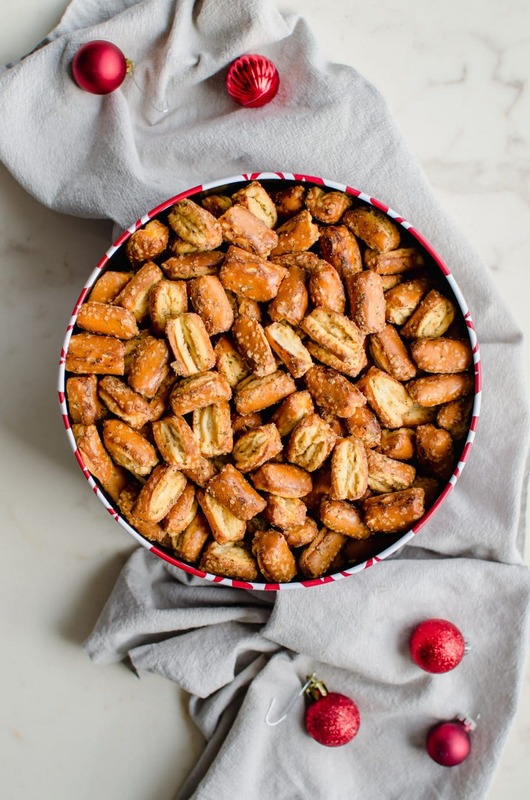 Amongst my family members, these savory little ranch pretzel bites are called “Nancy’s Nibblers.” You see, my mom has been making these pretzels for years….since I was a little kid. She got the recipe from a friend in Arkansas and has always made them around the holidays for us to munch on. 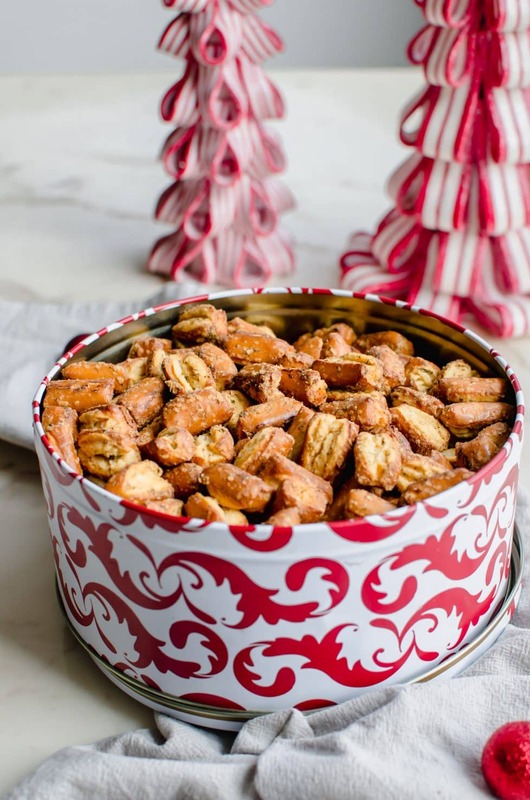 They are a perfect little snack mix to gift as well! One year, mom gifted them to an extremely kind and generous lady from our church who was confined to her home because of health reasons. Even though Mrs. Nancy rarely left her home, she was a significant presence in my family’s life because of her notes/phone calls/messages of kind encouragement and her generosity. Mrs. Nancy LOVED these pretzels at first bite, and called them “nibblers.” From that point on, she would tell my mom how much she loved the nibblers every time she saw her, and my mom made an effort to take them to her as often as possible. We think of her every time we make them now – I love how food ties us to memories with loved ones! 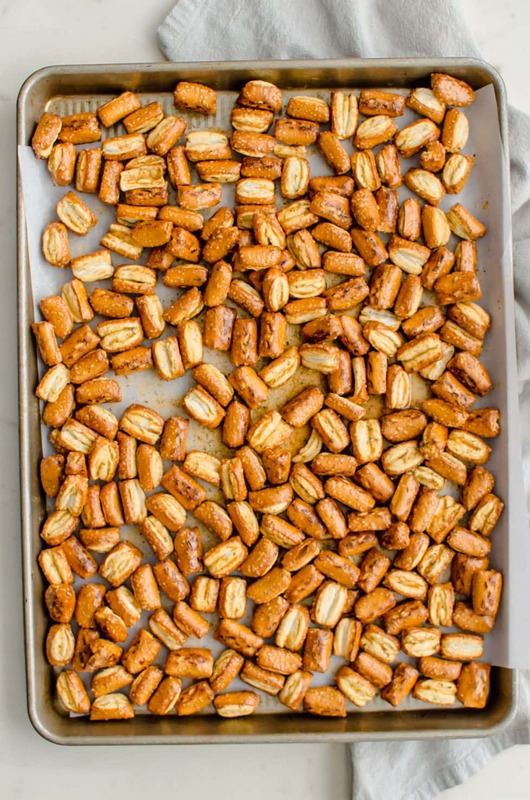 If you’ve ever made any type of Chex party mix before, then the technique for making these pretzels should be very familiar to you! The pretzels are coated in a mixture of oil and seasonings, then slow-roasted to perfection at a low temperature. This makes the pretzels extra crunchy and bakes the savory coating into every nook and cranny! Pro tip: the best types of pretzels for this recipe are the large, sourdough pretzels that you will break into 1” pieces. The jagged edges that result from breaking the whole pretzels are perfect for soaking up concentrated bits of the seasoning blend, which is the tastiest part of this snack! Unfortunately, at the time I made this recipe for the blog, I could only find the “nibbler” pretzel bites, so that’s what I used this time around. But if you can find the thick pretzel rods and break them yourself, that will be the ULTIMATE savory pretzel situation! When it comes to gifting around the holidays, I love to have a few back-pocket recipes that I can pull out to make in bulk and gift to coworkers, neighbors, hosts/hostesses of parties, and have on hand for last-minute get-togethers. 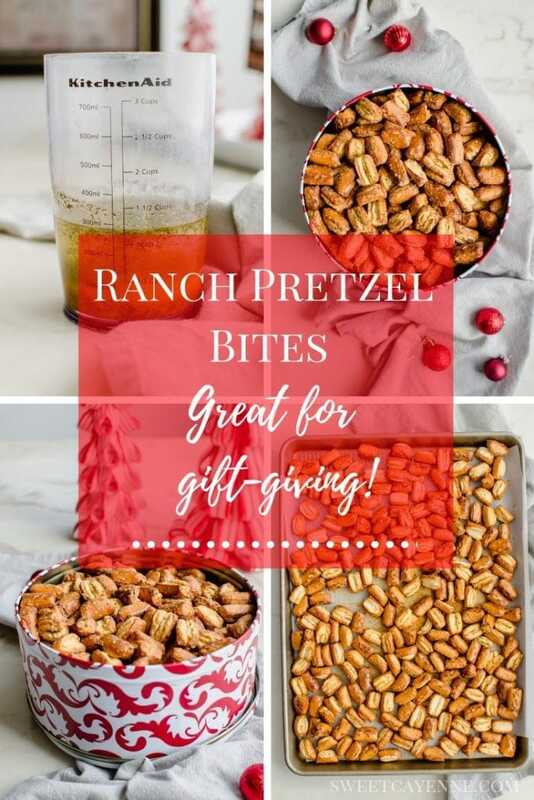 These ranch pretzel bites are perfect for those occasions because they are easy to make and the recipe can easily be 2x, 3x, or made into however many batches you need. And sometimes, you just need a good munchie to put out with drinks before a dinner party so that guests can have something to snack on while they mingle and you get food on the table! Been there, done that LOL! Are you ready to make these Ranch Pretzel Bites? I’m so excited for you to try this recipe. Once you get the chance to make it, please let me know how it turns out for you! Leave a comment and rate the recipe below. This will help me with the creation of future recipes! I’d also love to feature your creation in my monthly newsletter, so you can upload a photo to Instagram or Twitter with the tag @sweetcayenne5 to be featured! You can find me on YouTube also. Preheat oven to 200℉. Line a large baking sheet or jelly roll pan with parchment paper. Set aside. Place the pretzels in a large mixing bowl. 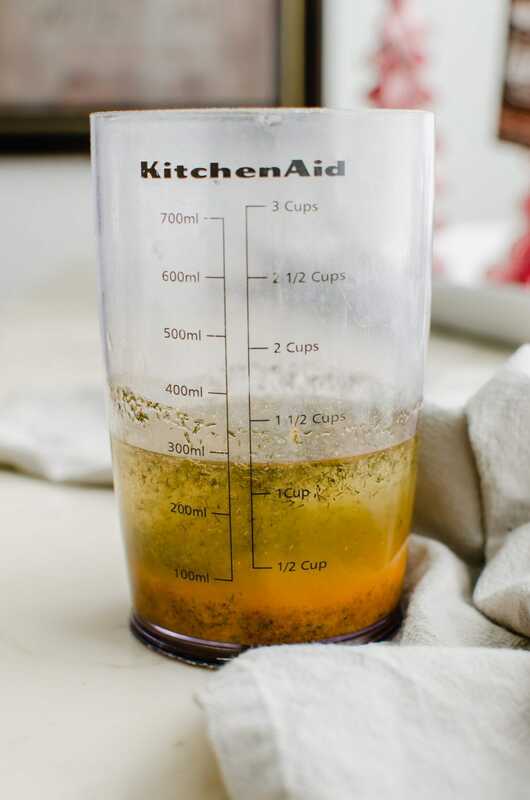 In a small bowl, combine the ranch seasoning, oil, dill, garlic and hot sauce by whisking together. Pour the seasoning mixture over the pretzels and toss to combine. Spread the coated pretzels in an even layer on the prepared baking sheet. Bake for 1 hour, stirring three times at the 15-, 30, and 45-minute mark. Cool the pretzels completely on the baking sheet before transferring to an airtight container for storage. Pretzels will keep at room temperature for up to 3 weeks.